Bradshaw Manor is a purpose-built home set in landscaped gardens next to the main promenade in Rhyl. 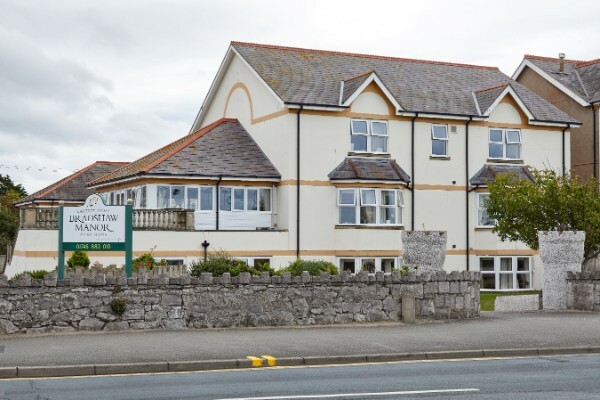 We have 66 beds, a warm and cosy atmosphere and lovely gardens with plenty of outside seating. Our aim is to provide the very best in person-centred care so that each resident feels completely supported in every aspect of their lives. Testament to our success is the fact that we performed strongly in Your Care Rating 2016, receiving an overall score of 947 out of 1,000. We have a packed activities programme, including arts and crafts, baking club, gardening, flower arranging, ‘Music & Movement’, ‘Time to Listen and a Tipple’, group walks, a weekly visit from Shasta the pet therapy dog, monthly minibus trips… The list goes on. Join Bradshaw Manor, and you’ll be part of a welcoming team with a clear ethos – we believe that residents don’t live in our workplace, we work in their home. We’ll make sure you have the learning and development you need to make a tangible contribution to our residents’ lives and achieve your career ambitions. The main town is within easy walking distance of the home and we have excellent public transport links, with a bus stop right on our doorstep. Bradshaw Manor is surrounded by a wealth of local attractions, including the Rhyl Pavilion Theatre. Chester is just 30 minutes drive away via the A55, and the beautiful Welsh countryside and the landscapes of the Conway Valley and Llandudno are quite literally on our doorstep. Why work at Bradshaw Manor Care Home in Rhyl? We provide 24-hour nursing care and support to older people. Bradshaw Manor also provides expert care for people living with dementia, including Alzheimer’s disease.